"There isn't much that I feel I need. A solid soul and the blood I bleed"
Stretching Out (this album) (1960). 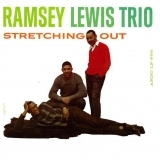 Sorry, no matches on eBay for "Put Your Little Foot Right Out The Ramsey Lewis Trio".